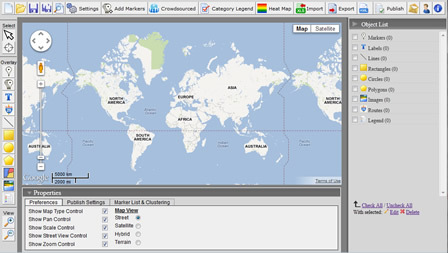 iMapBuilder Online (GMap Editor V1) is an online map maker. You could create your own map quickly with tools below. This topic will introduce functions of the application briefly. Save: Save the map project for future editing. Preview or print: Preview the created map or print it from browser. Publish and share: Get an embed code or a sharing link. Preference: Adjust map settings and basemap styles. Crowdsource: Let visitors to add place markers. Category: Filter objects into categories. Heat map: Present distribution of data with colors. Import: Plot a number of markers. KML file: Import and visualize geographic annotation. Locator: Navigate to a target place on the map. Marker: Drop a pin or use an icon to indicate a place. Route: Draw routes along roads. Line: Draw lines or paths on map. Map legend: Explains colors or units used on the map. Geographical region overlay: For coloring territories of countries. Clickable area: Draw shapes to display an area.